SUNNYVALE, Calif. and AMHERST, Mass., – A significant in-kind gift from Trimble (NASDAQ: TRMB) will expand the University of Massachusetts Amherst’s leadership in training and research in 3D building design, digital fabrication and the sustainable built environment. Partnering with Trimble allows UMass Amherst to more fully integrate across its curricula the technological tools that are rapidly transforming how building and living environments are designed and constructed. The gift will establish the 1,300-square-foot Trimble Technology Lab in the new Design Building at UMass Amherst. The lab will include equipment such as Trimble’s laser scanners, advanced robotic surveying systems, imaging rovers, Global Navigation Satellite System (GNSS) receivers and many of Trimble’s software packages including RealWorks® scanning software, Trimble Business Center, Vico Office Suite, GCEstimator™ Suite, Tekla® Structures, Sefaira Architecture and its popular 3D modeling software SketchUp Pro. The gift was made to the university’s building and construction technology program (BCT) in the College of Natural Sciences and is part of the successful $300 million-plus UMass Rising fundraising campaign. At the onset the Trimble Technology Lab will benefit three colleges and four departments: College of Natural Sciences (the building and construction technology program, department of environmental conservation, and the department of geosciences); College of Social and Behavioral Sciences (department of landscape architecture and regional planning); and the College of Humanities and Fine Arts (department of architecture). The Trimble Technology Lab will tie into existing “makerspaces” on campus to encourage experimentation, rapid prototyping, entrepreneurship and fabrication spaces. 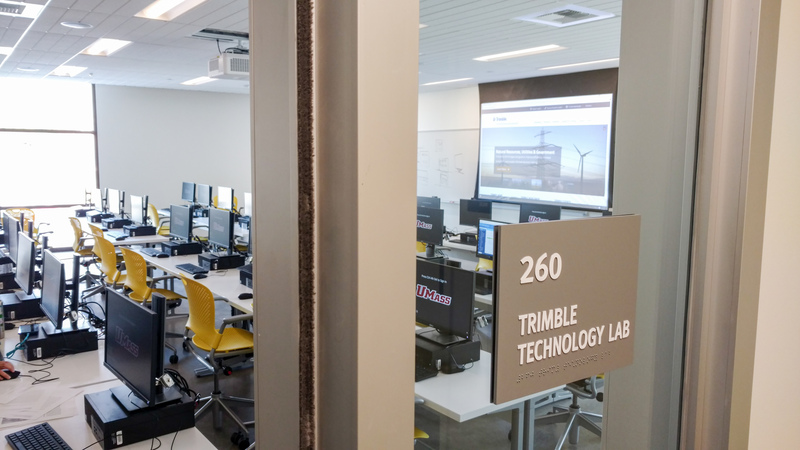 Schreyer said that Leers-Weinzapfel Associates used Trimble’s 3D modeling software as one of their primary tools in designing the new Design Building. As the largest heavy-timber structure in the Northeast, it already sets new standards for digital-based, sustainable construction on campus. The University of Massachusetts Amherst, founded in 1863, is the flagship of the five-campus UMass system. Home to the Commonwealth Honors College, UMass Amherst incorporates modern teaching methods involving new communication and information technology, yet remains an immersive, residential campus serving more than 22,000 undergraduate and approximately 6,300 graduate students across a comprehensive array of academic programs. True to its land-grant roots, UMass Amherst is engaged in research and creative work in all fields and is classified by the Carnegie Foundation for the Advancement of Teaching as a doctoral university with the “highest research activity” or R1. Together, students and faculty are deeply engaged in collaboration with communities—both regional and international—to improve their social and economic conditions. For more information, visit www.umass.edu. Trimble is transforming the way the world works by delivering products and services that connect the physical and digital worlds. Core technologies in positioning, modeling, connectivity and data analytics enable customers to improve productivity, quality, safety and sustainability. From purpose built products to enterprise lifecycle solutions, Trimble software, hardware and services are transforming a broad range of industries such as agriculture, construction, geospatial and transportation and logistics. For more information about Trimble (NASDAQ:TRMB), visit www.trimble.com.